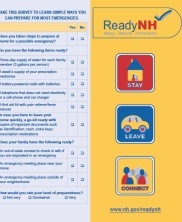 JSI collaborated with partners from around New Hampshire to develop ReadyNH, New Hampshire's emergency preparedness website. These training materials help individuals develop an emergency plan for staying in place, evacuating, and getting in touch with loved ones. JSI offers train-the-trainers to community members and partners who then offer Personal Preparedness Workshops across the state. JSI, 2009.